Turning Lebanon into Gaza -- Israel's hole card against Iran deal? Many observers have expressed concern that Israel could sabotage the Iran deal: fomenting a war with Hezbollah in southern Lebanon, and soon, so that the Israel lobby flips out in the U.S. and Iran and the United States are suddenly at dagger points rather than at the table. Hezbollah, supplied, trained, and funded by Iran, is building new military strongholds in Lebanese border villages. By doing so, Hezbollah has turned Lebanese civilians into human shields – much like Hamas did in the Gaza Strip. Hezbollah’s rearmament is a blatant violation of Resolution 1701. Is anyone stopping this? UNIFIL, the UN force in Lebanon, was supposed to oversee the implementation of Resolution 1701. But do any of you think UNIFIL is going to enter a Shiite village and remove rockets stored in houses? The UN is thus leaving Israel with a horrible choice if war breaks out again: Either the IDF will have to destroy the weapons now being stored in southern Lebanon, or let Hezbollah fire thousands of rockets into Israel. What would you do? Under the laws of war, Israel will have every right to destroy a house that has become a legitimate military target. Shouldn’t the UN avert this outcome by taking action now? Don’t hold your breath. This possibility requires an understanding of the power of the Israel lobby in its many manifestations. My friend cites the New York Times’s choices here as suspicious. The paper has a piece today on new disagreements between the French and the Iranians over the inspection protocols in the prospective deal; the piece includes a French claim that the U.S. was too flexible in the negotiations, as well as accounts of the “discord” that the Iranian leadership faces in its own ranks. And there’s a second piece by veteran Iran panic monger David Sanger reporting that Wendy Sherman, the chief State Department negotiator for the US in the P5+1 agreement, intends to quit immediately after the treaty deadline but before ratification, maybe to go to work for her old friend Hillary Clinton, and this means that all the top U.S. negotiators of the deal will have left the administration and so who is going to work out the details– suggesting a lack of commitment to the deal inside the government. We described the New York Times’ recumbent role in the Lebanon warmaking process 2 weeks ago. I see that Belen Fernandez at Jacobin has also scored the paper of record. In addition to repeatedly referencing the general views of “Israel,” “Israelis,” and “Israeli military officials and experts,” [Isabel] Kershner offers five direct quotes from representatives of the state and military apparatus. Team Hezbollah, on the other hand, is permitted one solitary defender, an anonymous “Hezbollah sympathizer” who points out that Israel has killed civilians in Lebanon. The whole “mowing the lawn,” “cutting the grass” statements are vicious and racist and if any other nation were to utter them they would be condemned. As to a summer war in Lebanon Israel why should the outcome be any different than 2006? The recruits who will fight it only know how to deal with unarmed children, housewives or college students. Their arrogance and racism will do them in again. They never learn. I agree. Imagine if some Arab leader had called for “mowing the lawn” in Israel. It is so obvious that the genocidal calls are much, much more from the zionists, but we have heard the whining and outrage, so loudly, when it comes to anything the other side says. I notice the “wiping Israel off the map” has been used ad nauseam to cry victim. During the massacre in Gaza, there were plenty of zionist leaders making genocidal statements, and even suggestions of putting Palestinians into concentration camps and used the words “exterminate”, reminiscent of the nazis. a blah chick – “mowing the lawn” and “cutting the grass” probably sound much better in the original German. How convenient, running to the UN to complain of inaction on a violation of a resolution when it suits them, while defying several other conventions and ignoring or disparaging critics. This is the bad kind of theater, that makes you aware you’re watching a (power) play. For shame. In politics you do what you can — the art of the possible. Israel has (effectively) immunity from UNSC and all know it. Good until revoked. But if it can get a resolution about Hezbollah, why not? MY COMMENT: I suspect Israel is determined to attack Lebanon (preferably under cover of a defensive pretext) in order to neutralize Hezbollah in preparation for bombing Iran. I’m a bit surprised that no one anywhere seems to have raised the possibility that Operation Protective Edge might actually be the first op of an operational trilogy. Israel’s second op would be neutralizing Hezbollah in Lebanon. After these two prerequisite ops have been completed, and Hezbollah and Hamas have been deemed sufficiently neutralized, the third op (i.e., the Grand Finale) would be Israel eliminating Iran’s nuclear program. P.S. Put another way, I wonder whether the Obama administration had to sign off on Israel’s Operation Protective Edge in order to keep Netanyahu from raising a stink about the talks with Iran being extended. Inspection of all military sites, interrogation of nuclear scientists, we have been here before. These conditions preceded the Iraq war. In this case, as in most cases, it is policy, not intelligence which will decide any future agreement. I suspect the goal posts will be moved again, right up to the finishing post. One thing is for certain, the Iranians will not be humiliated and I think they have the ability and military wherewithal to deter any aggression. Somehow I knew, at that point, that the Iraq will be invaded, and that those Iraqis already know it. What they wanted the world to see is that weapons inspections were just a pretext and their country ill be invaded no matter what they’ll do or say. Guess Poland felt like that in August 1939. I thank the heavens that the major difference between now and 10-15 years ago is that the blatant hasbara of the Times is highlighted, thanks to independent media. We should never forget to be grateful for that! will HuffPo and the rest of the liberal grassroots go along? I doubt it. Zionists like Josh Marshall of TPM surely will, but I doubt HuffPo intends to go along and the Pillar/Parsi Op-Ed is a good sign of that. Jacobin won’t. The Nation has moved past its hasbara stage but it isn’t ready fully embrace the reality just yet. And this would in turn mean that there isn’t just a divide between the Democratic establishment and the grassroots on Israeli Apartheid, but that this divide extends into elite establishment liberal media like the NYT and grassroots publications like HuffPo(which despite its size is still being run as if it headed by activists). Huff Po built a bridge to the facts some years ago. 10 years ago their moderators would not allow UN agreement, report links. Would not allow links to Non Proliferation Agreement, Going to Tehran etc. Would not allow links to proven Israeli crimes against humanity Times are a changin at Huff Po (USA Today of websites). They allow many more facts through. Not at the New York Bloody Times. Before the sale, when you opened Huffpo, you were immediately hit in the face with the Israel, Palestine, Middle East stuff. Not long after the sale, they buried these tabs. Hard to find. Has this changed for the better? Gosh, one wonders, given Josh Marshall’s description of his upbringing, when, how and why Marshall became such a big Zionist. Michael “Niger Documents” Ledeen. Now there is a man you can trust…yuch. Belongs on trial at the Hague. 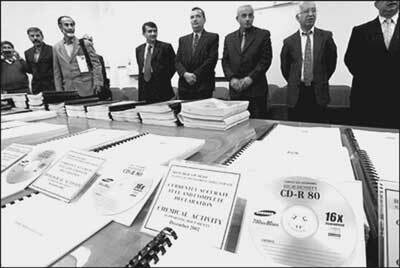 The stationery for those Niger documents was stolen from the Niger embassy in Rome in early January 2001, before Bush was inaugurated. One wonders who gave the go-ahead. The empire (or the empires, Israel being a subsidiary but “other” empire) are both run, to a great extent, by militarists and defense industries (military-industrial-complexes if you will). and these have a pro-war ideology which is not goal-directed except in favor of war. they believe that there will never be any cost to them, profits but no losses in their 5-year futures (as far as they ever look, hence no concern with climate change). Must be wonderful to realize (as American banks do) that there is no risk, no down-side, too big to fail, too big to jail — and both Israel and the USA evidently are run by folks who feel this way. And this feeling is also a “policy” so that government people who do not feel that way personally must act as if they do or get cut out. Oops see that is what your whole post is about. Clearly the Iraq/ Iran warmongers will stop at nothing to completely destroy the P5+1 deal. Yes, Israel is planning an attack on Lebanon. So what’s new? And yes, it’s also planning an attack on Iran. So what’s new? Just waiting for the pretext and/or the false flags? I think it’s great that Huffpo published Paul and Trita’s important piece. The only issue I had with what they wrote is the uncritical way they used the term “preventive war”. Basically, a “preventive war”, as opposed to a “preemptive war” is one that is quite optional for the state that wages it and the best casus belli the war initiator can come up with is that the war is to “prevent” some fairly distant and unquantified threat. It is thus very different from a pre-emptive war, which “pre-empts” a very clear and imminent danger and for that reason is sometimes allowable in the classic understandings of the laws of war. A “preventive war” is very different. I know that Paul and Trita know this, but I’m not sure how many readers of Huffpo necessarily do. Someone reading the term who’s not familiar with it may understand it to refer to a war that *actually* prevents something bad. Also, fwiw, the whole Dahiyeh Doctrine (using total destruction as a crushing means of collective punishment intended to force total submission) was *invented* by current Defense Minister Ya’alon against Lebanon in 2006. Bismarck said a preventive war was like suicide committed out of fear of death (Selbstmord aus Angst vor dem Tod). It will be different this time if Israel invades Lebanon. First of all, Hezbollah is battle hardened from it’s campaign in Syria. Second thing to consider is will Israel call on it’s ISIS allies to invade along with the IDF. I imagine the Israeli forces to be very soft. All they seem to do is bully civilians. In the last Gaza invasion they were hurt in ways they never imagined. Without the weaponry I think the Israelis are easily inferior. Not much more than saber-rattling intended to slow down whatever is being agreed to with the Iranians; the dumb and dumber Netanyahu-Ya’alon duo surely remember Nasrallah’s promise about the next war seeing Hizbullah forces inside Israel. Not a smart way to kick-start the summer tourist season. Nobody in Lebanon is losing any sleep over Israel’s war chatter. Walid- You know more about Lebanon and Hezbollah than I do. What I read is that Assad will soon (say less than 3 years) have to leave Damascus and become president of the Allawite’s in the Alawite region. At that time Hezbollah will be cut off from their support and Nasrallah has warned that the fall of Assad will be a disaster for Lebanon. Maybe you could shed some light. I’m not a fan of Assad. Nasrallah’s warning is actually a warning of what would be next in store for Lebanon if ISIS succeeds in toppling Assad. If it were to happen, it would be only a matter of time before ISIS puts all of its forces and effort to overrun Lebanon, which would be a relatively easy task. This is the main reason why Hizbullah is in Syria, it’s not to protect Assad as much as it’s to protect Lebanon against an impending ISIS invasion of Lebanon. Israel’s backing of ISIS is playing with fire; it’s only a matter of time before it turns on Israel itself. It has already started to turn on Saudia with last week’s bombing there. The dismantling of the three tribal, chosen-people-syndrome entities ISIL, JSIL and Saudi at each other’s hands/throats would be poetic justice. These chosen people are their own worst enemies and will be the reason for their own downfall by the laws of cause and effect. They scheme but the Universal God, not partial to any nation or tribe and too grand for any one religion or place, schemes better. “When we debated the Corker-Cardin just before, I mentioned my concerns about a potential nuclear deal with Iran. At the top of their list is how sanctions relief will be handled and what Iran will do with a new influx of resources. “Iran is the world’s leading state sponsor of terrorism. The Revolutionary Guard Corps and its Quds Force sow instability throughout the region. “Perhaps the most destructive has been Iran’s support for Hezbollah. Hezbollah again has prevented the people of Lebanon from building a better future. Hezbollah’s support has allowed the Assad regime to cling to power. And Hezbollah has stockpiled tens of thousands of rockets on Israel’s front doorstep. “What concerns me most is that Iran has been able to funnel resources to Hezbollah despite the burden of the most crippling sanctions regime in history. What’s going to happen if that pressure is lifted? “Well, we shouldn’t wait to find out. “Congress must act now to impose stronger sanctions on Hezbollah. We should choke them off from their Iranian patrons. “This bill would give the Administration every tool it needs to confront this dangerous group. “It would sanction foreign banks for knowingly doing business with Hezbollah. We need to send a clear message to companies getting tangled up with this terrorist group: walk away—walk away, or face the consequences. “The bill would also shine a bright light on al-Manar, Hezbollah’s television station, itself a Specially Designated Terrorist Group. Hezbollah uses al-Manar for logistical, propaganda, and fundraising purposes. It defies reason that this station is still carried by the satellite providers all over the world. We need to expose this puppet organization and this dangerous organization for what it is. “We passed this bill in the last Congress by a vote of 404 to zero. Today, let’s take another stand against the violence, murder, and terrorism that Hezbollah sows in the region. It’s time for an independent and free Lebanon. It’s time for an end to terror, and for a transition in Syria. And it’s time for the threats against Israel to end. It’s not enough that most Arabic-speaking stations mouth the propaganda of their Gulf Oil sponsors, especially Saudi Arabia and Qatar. It’s not enough that most American television promotes a Zionist and “moderate” (Saudi/Qatari) view of Iran, Syria and Lebanon. Congress needs to sanction cable providers from including Al Manar among their hundreds of listings. Congress also manages to find another way to impose sanctions against Iran just as Obama is trying to seal a nuclear deal with Iran. Parsi and Pillar are spot on! I take their warning of Israeli “preventive war” plans extremely seriously. It’s not something I foresee happening in the immediate future, but given the wacko-right composition of the current government, I believe adventurism in Lebanon is more likely than not for the reasons Parsi and Pillar outline. It’s significant to note the extreme discrepancy between the right and center over this. Ex-Mossad chief Efraim Halevy said recently that Hezbollah ” day by day, is contributing to the security of the state of Israel.” That sounds to my ears like a deliberate, if oblique, effort on Halevy’s (i.e. the security establishment’s) part to discredit adventurism by the right. What would inspire Halevy to make such a provocative remark unless he was concerned about what the “neocon mindset” is cooking up within the new government? Gold’s ambiguous wording is interesting. He doesn’t actually say that Hezbollah has been firing rockets into Israel, he merely alludes to their potential. In fact, Hezbollah’s rocket attacks on Israel ended in August of last year. Since then, Hezbollah struck Israeli forces once — inside Israeli-occupied Shebaa farms — in reprisal for an earlier Israeli airstrike on a Syrian convoy in the Golan heights. In short, Likud adventurism doesn’t need a threat. All it needs is a potential threat. If it was good enough for the Cheney-Bush administration, it’s good enough for Netanyahu. Not really and the title of this article of turning Lebanon into Gaza is absurd. With over 100,000 Lebanese rockets and missiles aimed at Israel, a resistance comprised of professionally trained fighters that some estimate at over 100,000 fighters and Nasrallah’s standing promise that if Israel attempts a blockade of Lebanon’s coast, Israeli shipping in and out of Israel would be stopped by Hizbullah’s cruise missiles. Turning Lebanon into Gaza and talk of cutting the grass there is dramatic but idiotic. Hezbollah’s rearmament is a blatant violation of Resolution 1701. Is anyone stopping this? It sounds to me as if Gold is paving the way for an even more elaborate argument that 1) whatever punitive action Israel takes against Hezbollah in Lebanon will be fully justified under international law; that 2) Israel may have no choice but to take action and that 3) time is growing short. I don’t know what you call that, but I call that Netanyahu flying a trial balloon. Maybe…using your logic: Since the Usa is rearming Israel…Hezbollah has every right to a pre-emptive strike. Or maybe…since presently…arms on both sides are just sitting in their storehouses…and silos…and not actually attacking anyone…no one needs to pre-emptively attack anyone. I call it Netanyahu’s desperate attempt at blocking the deal with Iran but as to actually starting a war with Hizbullah over it, this is another story. It’s evidently true that Hizbullah has violated UNSC 1701 by re-arming south of the Litani but on the other hand, Israel has violated the same UNSC resolution thousands of times since 2006 in its fly-overs of Lebanese territory. It’s highly doubtful Netanyahu would risk losing Tel Aviv or his oil rigs in another war with Hizbullah. You saw what happened to Ben-Gurion Airport with the primitive rockets fired by Hamas. Hizbullah has demonstrated that it has the unstoppable sophisticated 802-C cruise missile that flies at 5 meters above the water with a range of 300 km. The hit that the Israeli super destroyer “Hanit” took from Hizbullah’s 802-C in 2006 kept it in a Haifa dry dock for 2 years. Walid, I’d expect that Netanyahu and his confidantes would consider Israel’s own violations of UNSC 1701 to be an inconsequential matter in the court of world (mainly US) opinion once fighting got under way. More germane questions: How stable or unstable is the current ruling coalition and how does that impact decision making in military matters? Does Netanyahu listen to naysayers or merely demote them? (The latter seems to be the case). To what extent are members of his circle “victims of groupthink?” How rational are these “New Likud” decision makers? When you consider that Operation Protective Edge was substantially motivated by an unslaked thirst for revenge against Hamas for the murder of three Israeli teens (which was not even Hamas’s doing) one has to wonder. Whether an Israeli assault is likely this summer is another question. But I for one would not breathe a huge sigh of relief if the summer of 2015 passes without incident along the Lebanese-Israeli border. The situation seems dangerously unstable for the foreseeable future. When you consider that Operation Protective Edge was substantially motivated by an unslaked thirst for revenge against Hamas for the murder of three Israeli teens (which was not even Hamas’s doing) one has to wonder. substantially motivated by whom? a duped citizen army? certainly not the government or maybe you’ve not heard of mowing the grass. I for one would not breathe a huge sigh of relief if the summer of 2015 passes without incident along the Lebanese-Israeli border. I didn’t discount the enormous cost to Lebanon in all of this, part of it would be of course obliterated. His standing promise to Israel is that in the next act of war against Lebanon, Hizbullah would retaliate by hitting a similar objective in Israel; school for school, hospital for hospital, airport for airport and so on but the part I’m not comfortable with, is his promise to hit TA if Beirut is hit. It’s a given that since Beirut is a pro-US bastion, it would be spared in the same way it was spared in 2006; not a single pane of glass was damaged at that time by Israel at Beirut’s International Airport or its spiffy downtown for that very reason. The big Beirut airport dramatic hit in 2006 was a simple missile launched from an F16 that made a big hole in one of the airport’s runways that took the whole of 4 hours to repair. Not a single pane of glass was shattered in the new all-glass terminal. The supposedly dramatic hit of Beirut’s port involved a single missile hitting a parked semi-trailer in the port’s parking lot and setting it on fire. On the other hand, Israel flattened most of Lebanon’s southern Shia villages and the Beirut Shia suburb of Dahieh. Nasrallah shouldn’t wait for Beirut to be hit before hitting Tel Aviv but should do it as soon as the first Israeli bomb falls anywhere in Lebanon. The first comment you quoted was a reference to the timing of the operation. – “Motivated by whom”, you ask? Why by far-right MKs and their supporters, that’s who. Shaked, Feiglin etc. Your second quote takes my remark out of context; it was followed by “The situation seems dangerously unstable for the foreseeable future. ” That does change the meaning quite a bit, does it not? i think they knew hamas didn’t do it. but i agree it was revenge. revenge for breathing and being palestinians. Yes, I’d say that Efraim Halevy and other sober-minded security professionals would agree with you. Unfortunately, they’re not the ones calling the shots. The “New Likud” pols are. One of the biggest ironies is the labeling of Hezbollah, a resistance force against illegal Israeli occupation of Lebanon, as a “terrorist” organization. In what way is resistance to occupation “terrorism”? Its not like Hezbollah is sending suicide bombers into Tel Aviv, etc. And Hezbollah is one of the few forces that is actually fighting off ISIS. If anything, we should ally with Hezbollah. But so far Israel hasn’t had a lot of success getting their threats placed conspicuously enough that they can make this argument later. This provides us, the watchdogs, both an opportunity and a risk. The opportunity we have is to oppose these plans vociferously right now, before they have a chance to mature and become reality. The risk is in giving their hasbara even the slightest additional dissemination. It’s a tough choice, but I fear we have to seize the opportunity even though it means we must also accept the risk. Last time the IDF took on Hezbollah they had quite a rough time of it. Hezbollah are no patsies, and they’ve been rigorously battle-tested lately in Syria battling Israel’s proxies Daesh. If Israel launches another preemptive strike like the previous one, Hezbollah has no reason to hold back. The IDF will pay a steep and painful price if the Israeli government insists on using them as a tool of Zionist jingoism. Indeed. Seldom mentioned in the media and never by our politicians is the fact that since it launched the June, 1967 war, Israel has been belligerently and illegally occupying Lebanon’s Shebaa Farms. Not just the Chebaa Hamlets totaling about 9 square miles with wall-to-wall water at the foot of Jabal al-Sheikh (Hermon), but also the barren Kfarshouba Heights that afford a 20 km view into both Lebanon and Israel and 1/2 of the village of Ghajjar that control The Wazzani Springs that are been siphoned to Israel settlements. Thanks very much. I didn’t know the Kfarshouba Heights and half of Ghajjar were under Israeli occupation. I think they must have been seized after 1967. Misterioso, Chebaa Farms and Kfarshouba Heights (and not Kfarshouba Village) in 1967 at the time of the Golan grab and northern half of Ghajar in 2006 that UNSC 1701 called for its return to Lebanon; the southern (Syrian) half had been under Israeli occupation since 1967. But as with other UNSC resolutions, Israel gave it the finger and continues holding on to it. Israel is on record for having contravened territorially UNSC 1701 over 7000 times since 2006 but as far as Israel is concerned, those violations are of no consequence, as the only one that count are the rearming of the Lebanese south by Hizbullah. The point is that right now all those missiles that Hezbollah accumulated don`t help it given its main present worry with IS. I don`t think it has any attention slack left for Israel now. Some people here so much want to see Israel hit that got blind to the changed circumstances in Lebanon and the region. Israel is Hezbollah yesterday` worry or main target – it is that Assad loses is Syria and Lebanon is overrun by IS, helped there by its many internal antagonists that wait years for this opportunity (some of them Sunnis). Wrong assertion; Hizbullah has 2 worries at this point, ISIS being the most pressing one although not the most important. In Nasrallah’s own words of last week, the main focus is and will continue to be Israel. The fighting it’s conducting in Syria against ISIS/Nusra is mostly at close quarters in which long range missiles would not be effective. Those are being saved for Tel Aviv and the chemical plants of Haifa. Last week, Nasrallah also called on the army to clean up the ISIS/Nusra riffraff from Lebanon’s badlands at the Syrian border and if it can’t because the country’s pro-US political faction is holding it back from doing so, Hizbullah would step in and do it itself with some help from the badlands’ clans. Last night, 3 clan chiefs stepped up to the plate and reiterated Nasrallah’s pledge to clean up the country of its ISIS/Nusra terrorists, the 3 clan chiefs representing 3 important Sunni clans from the actual area in need of being cleansed. It’s the reverse of what’s happening in Iraq where the Shia armed clans are helping the Sunni get rid of ISIS such as at Sunni Ramadi. The West’s and Israel’s plan of having the Sunni fighting the Shia is beginning to backfire as they are now combining their forces to fight the common terrorist enemy. religious affiliation to thwart the evil plans concocted for our region. May the backfiring last ! Thanks for your ever bountiful knowledge and generous information, Walid ! I hate to be the guy with the cold water but you must realize that despite all the talk to the contrary Israel is not “the common enemy” of Arabia – if at all it is the other way round. But some Arabs have talked themselves into that for so long that it is hard to shed. The good news is: it appears that unlike in this blog the Arabs on the ground are changing track and Israel is far lower on their list of priorities – some even can see common-interest potential with it. As for Nasrallah despite all the brave talk I think he reads the map well and see no pint at all in another round with Israel. He is paid by Iran, the common enemy of Israel and Saudi-Arabia (so it is not just a Sunny vs Shia issue but mainly political/security/inter-national) but he is not going to commit suicide for it. So those who wait for him to do their bidding, namely hurt Israel, can continue to wait…. I guess you have not been listening to the rhetoric coming out of the new government. These are not nice people. You are trying to sell an Arab monolith the same as you do a Jew one. If you want to revise your comment to read…Arab ruling class…then you will actually have a grain of truth in it. It’s more like skunk water. Your post to bintbiba has a few contradictory statements; you have Nasrallah working for the Iranians but you also have him being reticent to take on Israel on their behalf and you are confusing the rapprochement to Israel by a few Arab dictators with the overall hate that the general Arab population feels towards Israel. Nasrallah would attack Israel only in retaliation to an attack by Israel. So far Israel is doing its dirty work only indirectly through its proxy and pals at ISIS. First decent post I have read from you. You are quite right. Despite all the whining and moaning from Israel and it’s zionist supporters, Arabs and the various gulf states do not see Israel as a common enemy nor as a priority enemy. It is Israel who takes the racist approach and lumps all Arabs, or even all Muslims, together as the common enemy. @oldgeezer (last sentence): Change “common enemy” “a threat”. But the point is that the conflict is just less than a century old, a sea drop on historical time scale, and already there have seen huge changes (as you also say) and given the fluid Mid-East that is likely to continue. So no point to rec-chew the old slogans, as many here do as a routine – and keep being “surprised” that what is hoped for never materialize. Aren’t you Israeli Jewish kids lucky? You get to inherit a war, and one not even a hundred years old. Now a lot of parents would tell their kids “Look you want a war, you go out and make your own!” Ah, but not Jewish Israelis, they want their kids to have the best of everything. “Here you go kids, your very own intractable conflict, and we made it just for you“. They will be so grateful! The hope of Israel that an attack by Iran as retaliation for attack by Israel against Hizbullah will lead to 1990 type of scenario endings devastation and sanction for 10 yrs . But chances are that the international community will not join . Sanctions will fail and US will have periodically attack Iran to keep it reined but unlikely given the possible challenges from other nations. Attack on Iran can only come if Rusdia and China were sufficiently bribed but they won’t be easy to be bribed anymore for the eventual risk point to their direction – thanks to Ukraine and pivot to Asia. This will unite China,Russia,and Iran and there would be new Cold War . Israel will work on the side of US but Iran will find new clout in Levant . Istael security will be compromised . Chances are regimes like Jordan and Saudia Arab will be destabi,oozed leading to major disruption of oil supply from violence. Venezueala might decide to cut oil supply to US leaving US economically strained .